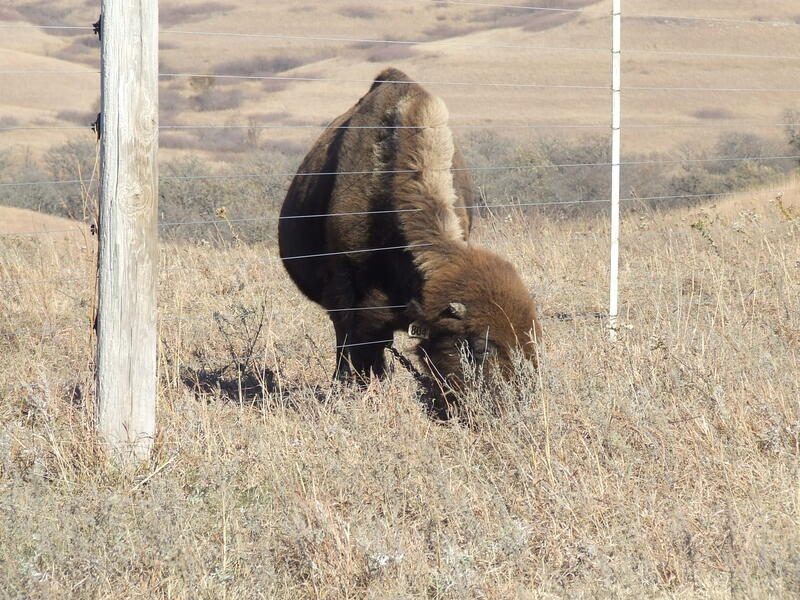 A modern megaherbivore: Bison bison at Konza Prairie, blithely disregarding the grazing experimental design. What were the ecological consequences of the end-Pleistocene megafaunal extinctions? While the causes of the North American megafauanal extinctions have been the source of extensive debate, the ecological consequences of theose extinction have received less attention. My research suggests that the late-glacial collapse of native megaherbivores may have contributed to novel plant associations by releasing deciduous trees from herbivory and altering fire regimes follow the build-up of forest fuels (Gill et al., 2009; 2012). How did ice age food webs respond to environmental change? As part of a new NSF-funded project, we’re working with fossils from the Project 23 excavations at the La Brea Tar Pits to understand how ice age food webs responded to natural climate variability before the major environmental upheavals of the last deglaciation. These new excavations are exciting, because for the first time they allow us to really characterize the small mammals and plants at one of the most important fossils sites in the world. We’re interested in whether connectivity within these food webs can predict which species were most vulnerable to extinction. Since we know which animals actually went extinct in the end, we’ll be able to test our models against reality, and ideally use them to predict extinction risk in contemporary settings. Can species keep pace with future climate change? PhD student Ben Seliger is using past and present tree range dynamics to test how well these long-lived, immobile organisms are tracking their climatic niches. To do this, he’s using a combination of species distribution models, modern range and trait databases, and fossil pollen data to determine how well trees fill their potential ranges. We’re particularly interested in testing the Janzen and Martin hypothesis — the idea that trees that produce fruits thought to be dispersed by long-extinct megaherbivores. Testing whether modern trees are in equilibrium with climate can help inform which species are good candidates for managed relocation, and whether rewilding can be a useful tool in the conservation of trees such as endangered Torreya taxifolia. How sensitive are terrestrial-marine linkages to global change? The Falkland Islands are a biodiversity hotspot in the South Atlantic, home to critical breeding habits for penguins, other seabirds, and marine mammals. These animals are an important source of nutrients for native tussac grasses, which in turn provide shelter from persistent westerly winds. PhD and A2C2 IGERT student Dulcinea Groff is researching the impacts of abrupt climate change, anthropogenic changes in fire regimes, and non-native sheep grazing to this terrestrial-marine linkage, using the sediment record. We’ve partnered with the South Atlantic Environmental Research Institute and Falklands Conservation to provide a paleoecological context to the modern conservation of these beautiful islands and their important biota. You can read more about Dulcinea’s work at our Experiment.com crowd-funding page. What were the impacts of prehistory humans on islands? Islands are often important ecological hotspots, but can be highly sensitive to anthropogenic activity. Despite this, the prehistory of most island environments, and especially early human impacts, are poorly known. We are using multi-proxy sediment records to investigate prehistoric environmental change and human impacts in Jamaica and the Falkland Islands. The Falkland Islands wolf, or “warrah,” was the first carnivore to go extinct in the historical record, due to overhunting by European sheep herders in the 19th century. It was also the only native mammal on the islands, and its origins have long been contested; to date, there is no definitive evidence as to whether people visited the Falklands before European arrival in the 18th century. PhD student Kit Hamley is investigating the islands for evidence of prehistoric human activity using the charcoal and archaeological record. By nailing down when and how the Falklands arrived, we can better understand how native biota (including a number of species of ground-nesting seabirds) were affected by global change in the past. Kit has been active in the Follow-a-Researcher Program at UMaine, bringing this research to thousands of K-12 students. On the other side of the equator, Jamaica is also a biodiversity hotspot, with very little known about its human prehistory — including the timing of human arrival. MS student Mario Williams is investigating the relative roles of climate change, indigenous land use, and European colonization on this tropical biodiversity hotspot. You can read more about Mario’s project at his Experiment.com crowdfunding page. If you’re interested in joining the lab, Jacquelyn is always happy to hear from motivated, inquisitive students interested in pursuing honors theses, graduate degrees, or postdocs related to extinction causes and consequences, paleovegetation dynamics, conservation paleobiology, islands, or historical legacies. Please email her a CV and a brief statement of interest (read this post first).